Overwatch is a security platform designed to secure network connected devices. Its purpose is to help device owners, fleet operators, server admins, DevOps engineers, and more, track and monitor their devices and servers, preventing nefarious actors from unauthorized access and detecting irregluar behavior that might otherwise go unnoticed. You can think of Overwath as a edge-deployed firewall and security monitoring solution. Overwatch uses an installable device agent to monitor your devices, analyzing and logging their regular behavior and enforcing security rules that you configure in the Overwatch web interface. The term Device refers to any platform or physical hardware on which our agent can be installed. Our agent runs as a service on your device and its purpose is two-fold: it enforces any Security Policy rules that you’ve defined in the Overwatch web interface, and it sends regular status updates to the Overwatch platform for analysis. The information sent out by the agent include plain keepalives, inbound and outbound traffic data, open connections and general details such as the device’s IP. The privacy of our user’s data is very important to us, as such all communication between the agent and the Overwach server is encrypted, and while we do analyze the behaviour of the device — such as the amount of traffic exchanged between the device and the network – the data itself is never sent to Overwatch. If you have any concerns about privacy, please get in touch and we’ll be happy to discuss our security measures in more detail. After creating your Overwatch account you can follow the instructions at our device onboarding page to run the agent installation script. In order to keep communications between devices and Overwatch secure, each device is identified through a SSH key created at install which will be shown on your device after running the bootstrap script; you can then either register the device in the Overwatch web interface by copy-pasting the SSH key into the UI, or you can use the agent itself for device registration with its command line interface. Once the registration is complete, your device will be able to connect to our servers, start sending health reports and download and enforce any security policies you set up for it. The Overwatch agent has a command line interface that allows you to perform basic administrative tasks. You should have the executable available as overwatchd in your PATH. The agent can register itself without you accessing the Overwatch web interface. $ sudo overwatchd --register --name "Media Center Raspberry Pi"
This will prompt an interactive email/password input and register the device under the ownership of the authenticating user. The --name flag is optional and Overwatch will generate a name if none is specified. Alternatively, you can specify a --token <token> to skip the interactive prompt. This token is associated with your account and this step will register the device under your account directly. This is especially useful when installing the agent in bulk on multiple devices. You can get your registration token at any time with the --get-token flag. You will be required to provide login credentials. You can recreate SSH identity keys at any point. If you do, you will need to register your device again, as it will appear to Overwatch as a completely new and unrelated device. The Overwatch agent is installed as a service on your device, as such, you’ll be able to issue standard service commands to control its behavior. We have plans to support additional IoT focused platofrms and hardware in the near future. In the meantime, if you’d like to run Overwatch on a platform that is not listed here let us know and we’ll look into adding it to our bootstrap process. The Security Center provides a high-level overview of all your devices, and it’s the root view of our web interface when you’re logged into your account. 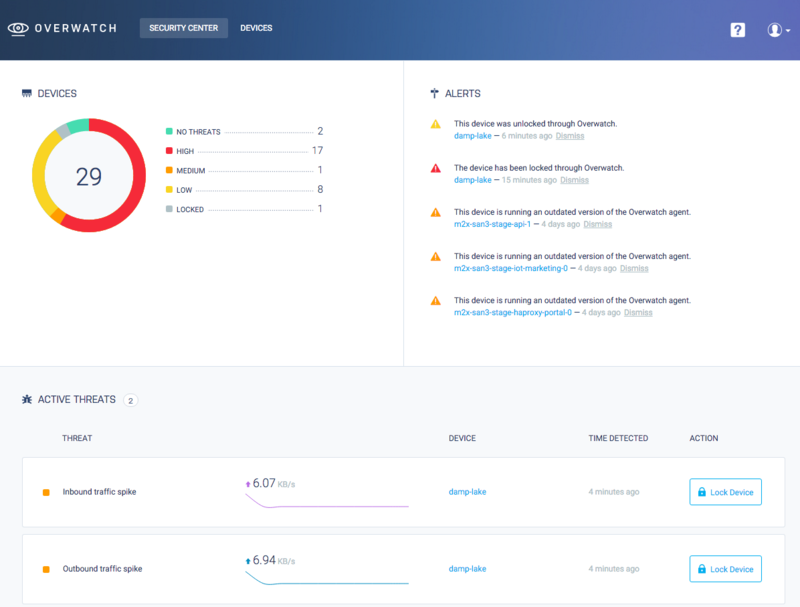 On it you’ll see an aggregate view of all alerts, threats, connections and overall threat level of all the devices registered under your account. You can see a list of all devices registered under your account along with a summary of their current status on your devices page. 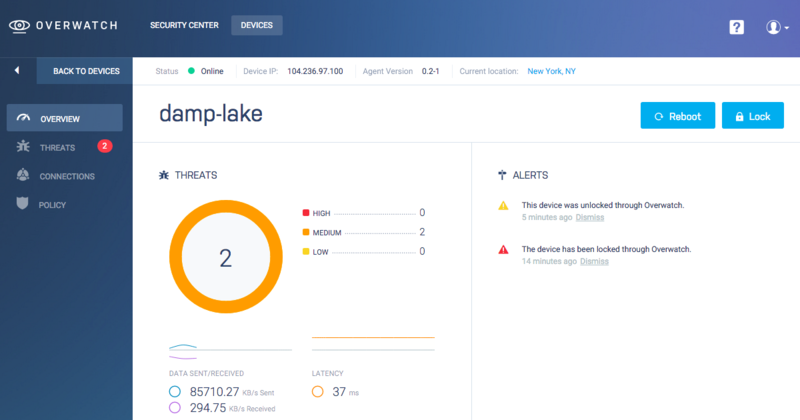 The device view contains an overview of your device activity, on it you’ll see a summary of alerts, threats, and currently open connections. Here you’ll also be able to perform security actions on the device. You can send commands to your device via the Overwatch web interface. Keep in mind that for the device to execute these commands it needs to be able to connect to the Overwatch server. In cases where a device is offline, Overwatch will enqueue the action and push it to the device as soon as it regains a secure connection. The Reboot action sends a reboot signal from the Overwatch server to the device agent, which forwards it to the host operating system. A rebooted system should come back online in Overwatch after a few seconds or minutes depending on your device hardware. The Lock Device function instructs the agent to block any outbound or inbound connections from your device except for the secure connection to the Overwatch server. You can use it to stop undesired access on a compromised device or simply to keep it secure until you can examine it further if you see any irregularities in its behaviour. In most cases, locking a device will prevent it from operating as usual for its designed purpose until it is unlocked. Use the Lock Device feature carefully. Alerts are notable events that happen to your device. Alerts don’t necessarily signify that a system has been compromised, but simply inform you of activity that might require your attention, like changes in the device connectivity data, potential security vulnerabilities (even though they might not be currently exploited) or the need take security measures like upgrading your security software. The Security Policies page for your device is accessible through the left sidebar navigation menu (“Policy”). From the Policy page you can set criteria by which most threats are evaluated as well as restrict the type of outbound and inbound traffic that your device is allowed to accept. Threats are heavily influenced by the policies you configure for your device and we recommend going to the policy page of every new device to set up sensible policies depending on the device’s intended regular use. Threats signify an irregular occurrence on your device. There are different types of threats depending on the specific irregular behavior, but in general, treat them with care and analyze them to determine if they are within your accepted use of the device or if they might be caused by malicious access from a third party. Threats are triggered based both on the security policies for a device and on significant deviations in behavior as observed by Overwatch: unusual traffic spikes or number of open connections are some of the events that might trigger a threat in a given device. If a high number of perceived threats has been detected on one of your devices, you might want to head over to the Threats page from the left sidebar menu in order to see a complete list. The device overview includes a list of currently open connections detected on your device, along with details such as IP, ports used, protocol type of the connections, along with geolocalization data when available. Keep in mind that this list will include the secure connection to the Overwatch servers. For a complete list of all connections go to the “Connections” page on the left navigation menu. Find a security vulnerability? We rapidly investigate all reported security issues. If you believe you’ve discovered a bug in Overwatch’s security, please get in touch at security@overwatchsec.com (optionally using our PGP key at the bottom of this document). We will respond as quickly as possible to your report. We request that you not publicly disclose the issue until it has been addressed by Overwatch.